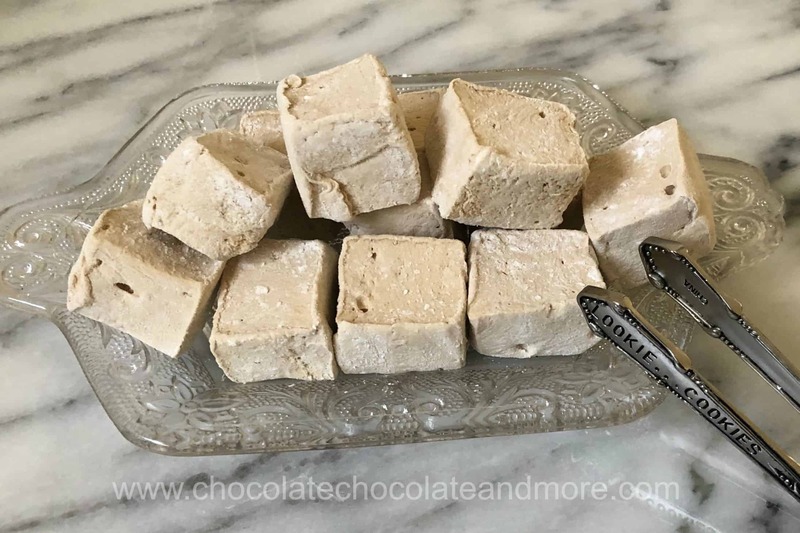 Coffee Marshmallows - Chocolate Chocolate and More! Want to add that something special to your hot chocolate? Try coffee marshmallows. They melt better than store-bought and you get a creamy cup of mocha. It’s a good thing they’re so easy to make because they disappear fast! When Becks was home over Christmas break, I made several batches of marshmallows – vanilla, peppermint stick, coffee and chocolate (coming soon). The weather was cold and rainy so perfect for hot chocolate. And we drank a lot of it. Flavored marshmallows are wonderful all by themselves. Coffee marshmallows taste like a creamy cup of coffee. And, homemade marshmallows melt more nicely that store bought. This recipe is incredibly easy if you have a stand mixer. If you don’t get a friend (or kid) to help. I save time by doing things during the “wait times” in the recipe. While the gelatin is softening in the warm water, I put the sugar syrup on to boil. While the sugar syrup is cooking, I quickly set up my pan and oil the spatulas. From start to letting the marshmallows set up in the pan only takes about 15 minutes if you do it this way. The amount of time it takes for the coffee marshmallows to set depends on the temperature of your house. Mine is pretty cold so they were ready to cut in about 4 hours. You might be able to speed this up even more by putting the pan in the refrigerator. If you’re as picky as I am about getting every last drop out of the bowl and off the beaters, you’ll have to give that up. The longer you whisk the marshmallows, the fluffier they are. But, if they get too cool, they’ll solidify in the bowl. I beat mine until the bowl was still warm but not hot. Once you lift the whisk out, the marshmallow on it will start to solidify. So scrape as much marshmallow off as you can quickly and sacrifice the left over. I dunked my whisk in cold water to solidify it instantly and gave it to the kids to “lick”. 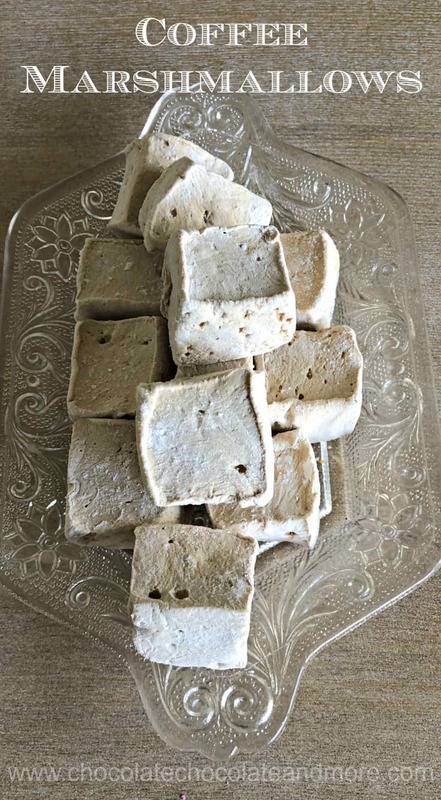 This recipe makes 55 large marshmallows (1 inch cubes). If you want smaller portions, you can cut the marshmallows into smaller cubes. You can also grease cookie cutters and cut the marshmallows into shapes but you will probably want a larger pan (10 x 15″) so the marshmallows are thinner. 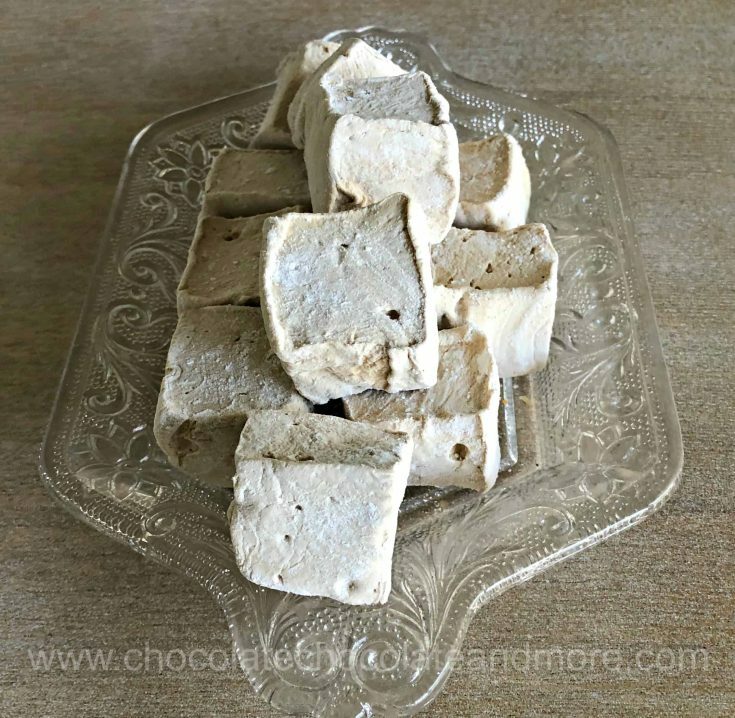 You are going to love these easy, creamy and delectable coffee marshmallows! Put gelatin, warm water, and instant coffee in the bowl of a stand mixer with a whisk attachment. Let sit while you make the sugar syrup. Line a 13" x 9" pan with aluminum foil. I used one sheet that fit lengthwise and then put a second sheet that fit width wise over it (like a plus sign). When you push the two sheets into the pan, the edges line up in the corners with no wrinkles. It's OK if there's a little gap between the edges. You also want a couple of inches of aluminum foil to hang over the sides. This makes it easy to remove the marshmallow from the pan. Spray the aluminum foil with cooking spray. Also spray two spatulas with cooking spray. Put sugar, corn syrup, salt and water in a large, heavy saucepan making sure not to get any sugar on the sides of the pan. I put the water in last and use it to rinse and sugar off the sides. Bring to a boil and cook on medium high heat until the mixture reaches 240°F. If needed, stir to mix the ingredients but you should keep stirring to a minimum. Once you reach 240°F, you will need to work quickly. Turn off the heat. Turn your mixer on low to break up the gelatin. Then turn it up to a medium speed. Gradually pour in the hot sugar syrup until all is mixed into the gelatin. Then turn your mixer on high. You will beat the gelatin mixture until it's just slightly hot (you can put the back of your hand on the bowl). Now you have to work quickly. Remove the whisk and use one of the spatulas to scrape the marshmallow into the bowl (or into the pan). Then use the second whisk to quickly scrape the marshmallow out of the bowl while you pour it into the prepared pan. You won't be able to get all the marshmallow off the whisk and bowl before it solidifies so there will be a generous beater for someone to lick. Mix the powdered sugar and cornstarch together. Dust the top of the marshmallows with some of the powdered sugar mixture. Cover with plastic wrap and let sit for at least 4 hours (or overnight). Turn out onto a board sprinkled with the powdered sugar mixture. Remove the aluminum foil and dust the top of the marshmallow with more powdered sugar mixture. Spray a sharp knife with cooking spray and cut the marshmallow lengthwise into 5 strips. Then cut each strip into cubes. Place the remaining powdered sugar mixture in a bowl and coat each marshmallow with it. Dust off the extra powder. Store in an airtight container for up to 3 weeks. Nutrition information is provided as a guideline only. If you have specific dietary requirements, please consult a dietitian.